This recipe is not one I would call quick or simple, but it makes you feel like a real chef and challenges your abilities in the kitchen. Or at least it challenged mine! SO worth the time and work! 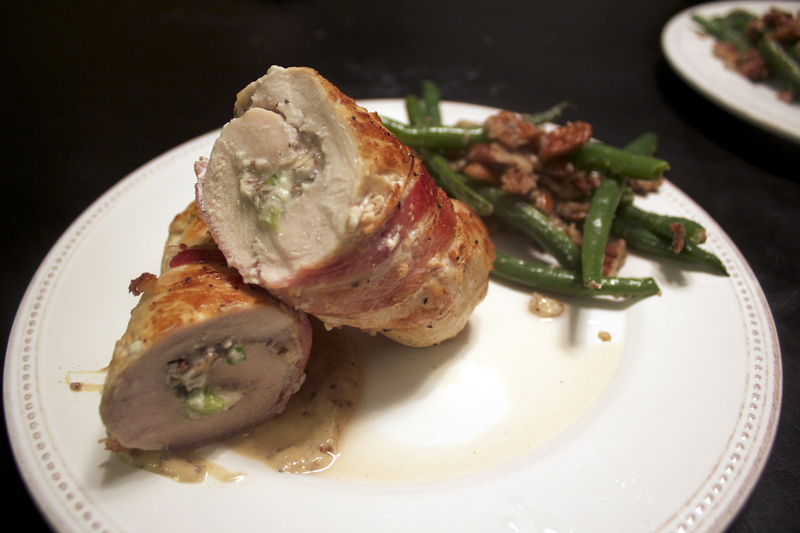 You can click here to see how to make the green beans I served along with the chicken. It’s another blue cheese recipe! You can do quite a bit of “make-ahead” work on the chicken so that you have minimal cooking to do closer to serving time. 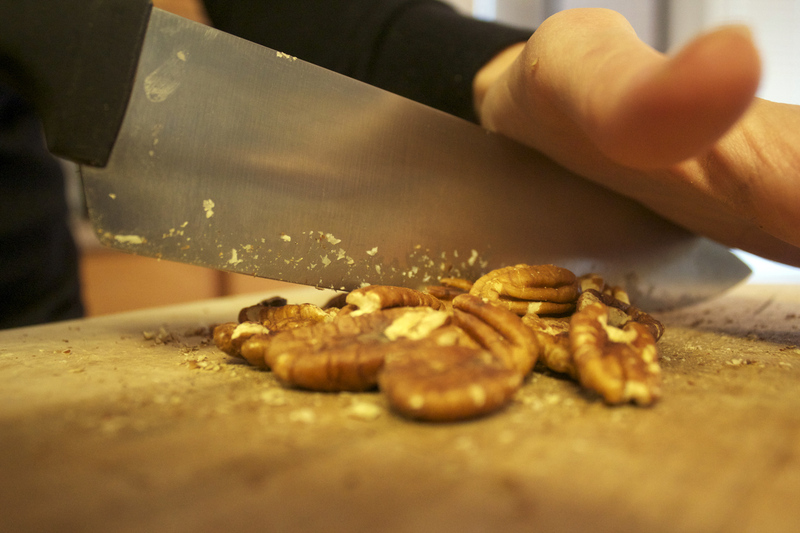 Start by measuring out 1 cup blue cheese crumbles, 1/4 cup pecans, and slicing 2 scallions. Leave the crumbles in a 1 cup dry measurer until you need them. 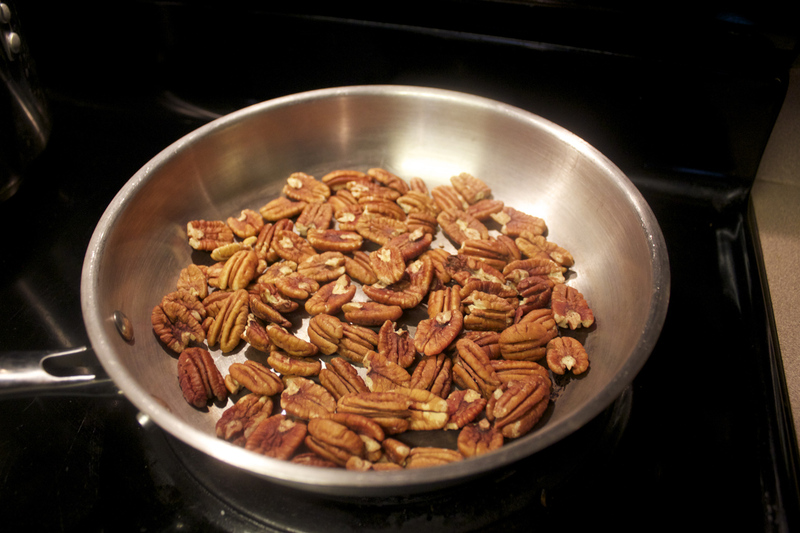 Toast your 1/4 cup pecans in a small skillet over medium-low heat for about 6 minutes, stirring frequently. Since I made this chicken along with Green Beans that also required toasted pecans, I toasted them all together (hence the MANY pecans in the saute pan in the picture below). 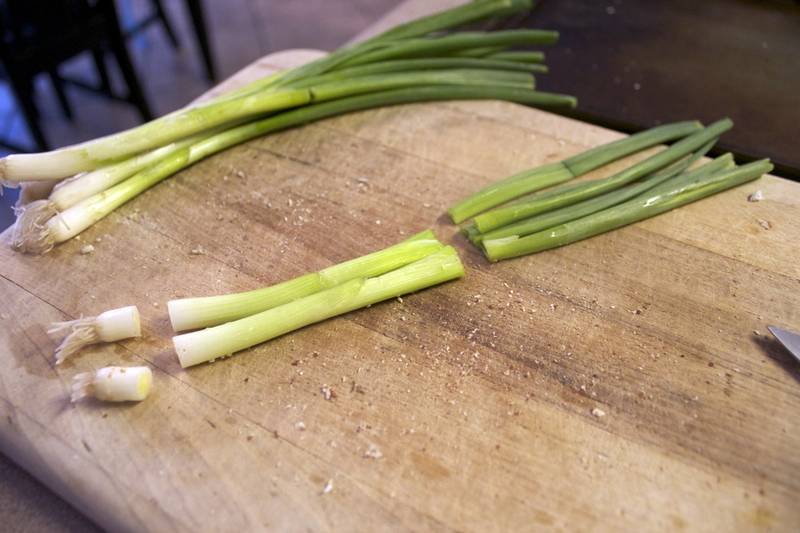 When you slice your scallions I think you only use the white parts of the onions. I’m not 100% sure on this, but in my experience the recipe usually tells you to use BOTH the white and green parts if you need to do so. Otherwise they just want you to chop off the very bottom and the tops of each green onion (or scallion) before using it. I don’t think it would ruin the recipe if you used both parts, but I only used the white parts. Your call. The recipe tells you these should be “sliced on bias”. 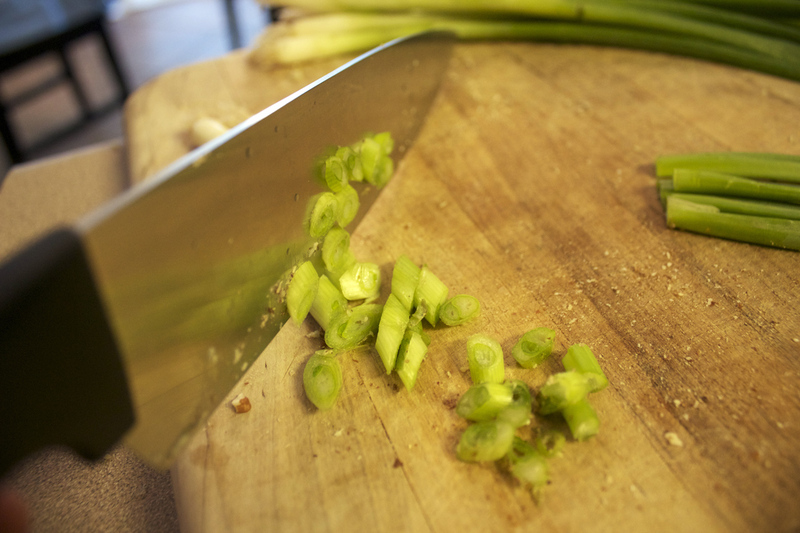 All this means is that you should slice at an angle, creating diagonal cuts through the onion. Now to prep the chicken. This was the more complicated part for me. You have to “butterfly” the chicken breasts. I messed up two of them during my attempt to get three of them done correctly. 🙂 I’ll still be able to use the chicken but messing up the butterflying makes it difficult to stuff/roll the chicken breasts properly. In cooking, to “butterfly” means you split the food (such as chicken) down the center (crosswise), but not completely through. The two halves are then opened flat so that they resemble a butterfly-like shape. I prepared only 3 chicken breasts as I was only serving 2 adults and 1 little girl. We had a lot of left overs even after reducing the recipe. Next time we’ll only make two chicken breasts. After having some trouble I figured out that it’s really important to err on the side of not risking cutting all the way through. After you cut a good part of the way through you can open the chicken as much as you can, and then carefully run the tip of your knife along the center until the chicken opens up all the way. It should lie flat and resemble the shape of a butterfly. 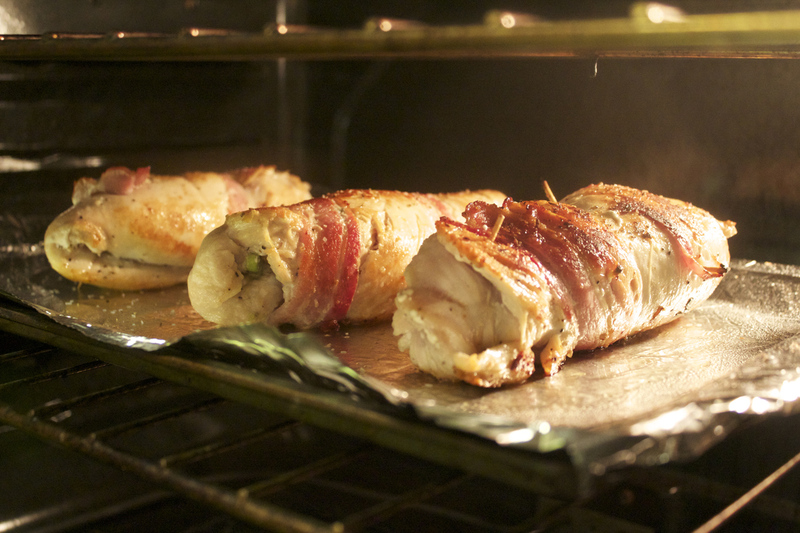 Lay out the chicken on a large sheet of parchment paper. Place another large piece of parchment on top of all the butterflied chicken and use a kitchen hammer to gently pound out the chicken so that it’s all the same thickness. You don’t want half of the chicken breast to be thicker than the other half. Peel off the top piece of parchment paper. Season the chicken with salt and pepper. 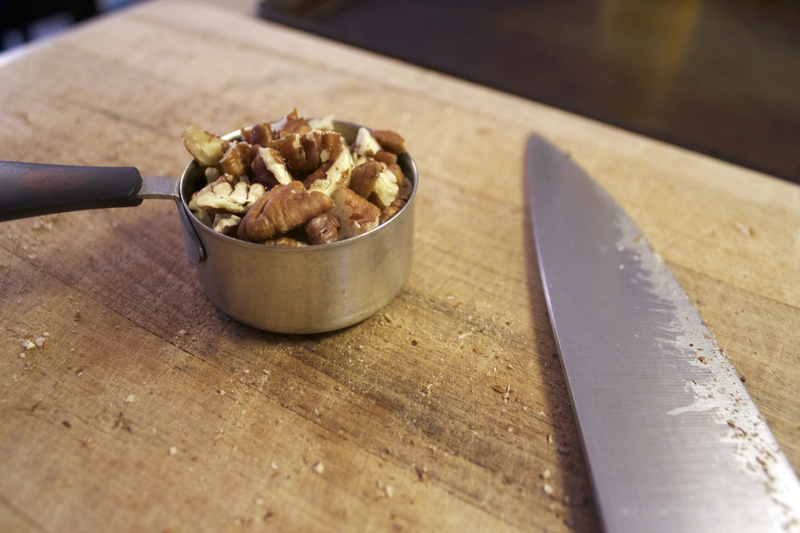 Put 1/4 cup crumbled blue cheese and about 1 TBSP of toasted chopped pecans on each of your chicken breasts. Then divide the scallions evenly between your chicken breasts. Leave a small border around the edge of each butterflied chicken breast so the stuffing doesn’t fall out when you roll it up. The recipe does not specify which direction to roll up the chicken. I decided to start from the tip (or bottom) of the “butterfly” and roll upward. 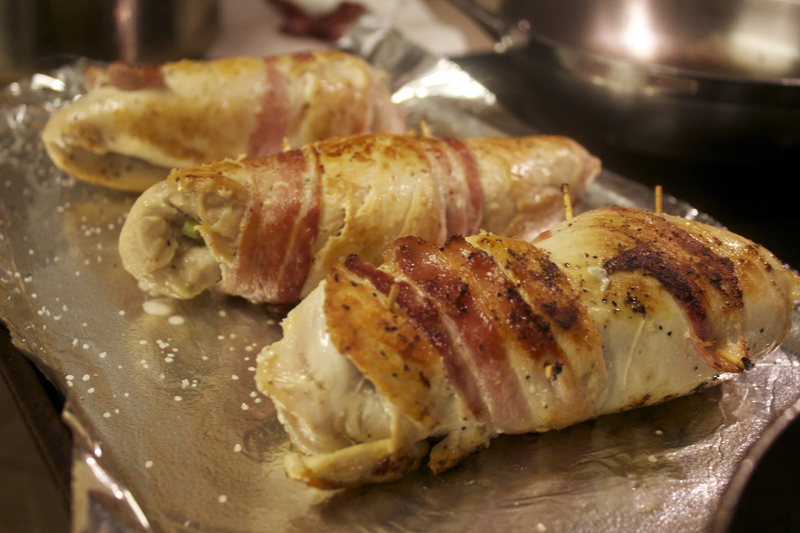 Wrap each chicken breast with one strip of bacon and secure the rolled chicken (and bacon) with a few toothpicks. Just be sure to pull them out before you eat them! Season the outside of the chicken breasts with a little salt and pepper. Now that you’ve prepped your chicken you can put them on a plate, cover them, and stick them in the fridge until you serve. I would suggest taking them out of the fridge about 20 minutes before you’re going to start cooking them just to take the chill off. 1. Cover a sheet pan with foil. Make sure it’s big enough to hold all your chicken without crowding them. Spray the foil with cooking spray and set it aside. You’ll need it right after you’re done browning the chicken. First you’re going to brown the chicken on all sides. This will give your chicken great flavor and give it a beautiful golden brown color. If you’re going to brown them all at once use a LARGE saute pan. My largest burner isn’t that big so I used a medium saute pan and browned them in two batches. Put your pan over medium-high heat and add 1 TBSP of extra virgin olive oil. 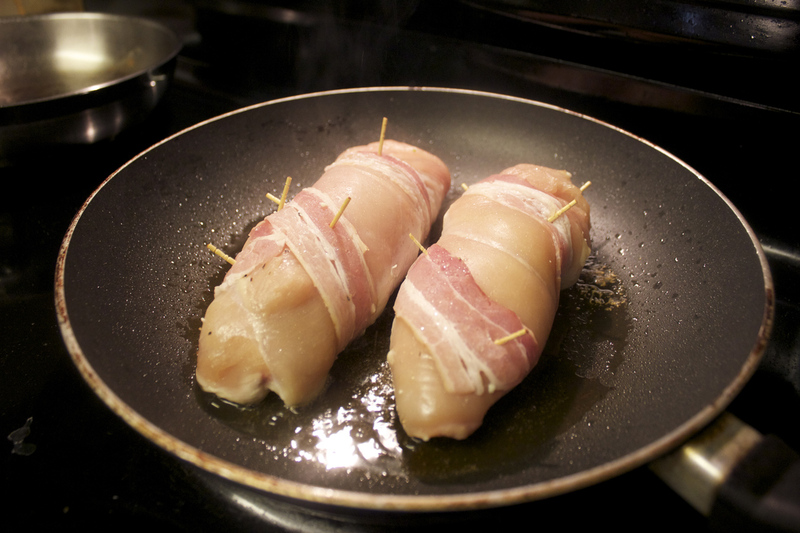 Give the oil a minute or so to get hot then move your rolled/ stuffed chicken breasts to the pan. Once they are in the pan DON’T move them! If you do the chicken will rip and you’ll lose all that wonderful flavor. Just let it be for 2-3 minutes and let the heat do its job. The chicken will no longer be sticking to the pan when it’s ready to be turned. Turn it over onto the opposite side and repeat the browning for 2 minutes or so. Then turn it on both its sides for 2 minutes each so that all the sides are well browned. Browning the chicken will take about 6 minutes total time to do all the sides. It took me about 12 minutes since I did it in two batches. Move the chicken right on to your prepped baking sheet. Put them in your 350 oven for 10 minutes to finish cooking them. My chicken took about 17 minutes in the oven. I took them out at 10 minutes like the recipe said. After letting them rest several minutes I cut into the thickest one and saw it wasn’t finished cooking. I stuck them all back in the oven for about 7 more minutes and they were done! So, if you have really large, thick chicken breasts (two of mine were really big) you’ll probably need to add some time in the oven. While your chicken is finishing up in the oven, make your sauce and work on your side dishes. It’s 2 TBSP butter, 2 TBSP flour, 1 cup chicken stock, 1/2 cup heavy cream (or half-and-half), and 2 TBSP whole-grain mustard. You can prep this before you start browning your chicken if you like. Then you’ll be ready to start the sauce right when the chicken goes in the oven. 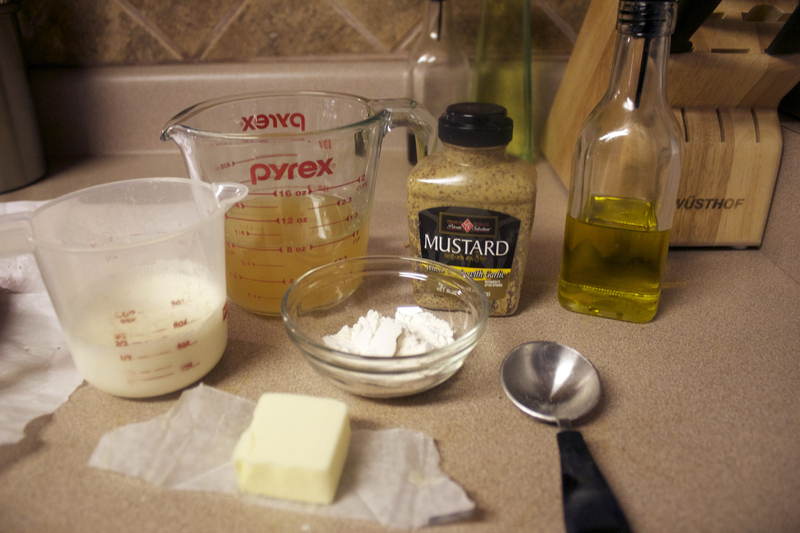 Melt the butter in the same saute pan you browned the chicken in. Put the burner on medium heat. When it’s fully melted add the flour and stir it with a whisk for about 1 minute. Then whisk in the chicken stock. Let this bubble up and thicken for a couple of minutes, then gently whisk in the cream (or half-and-half) and whole-grain mustard. Reduce the heat to low and season the sauce with salt and pepper to taste. 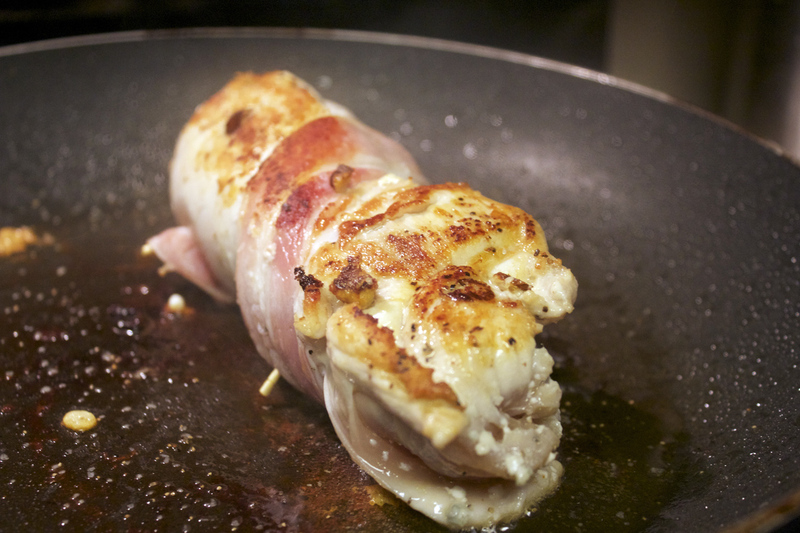 If you’re presenting this on a platter, cut the chicken breast in half to expose the stuffed center. Rest one half on top of the other to showcase the stuffing. You can put a little pool of the sauce on the platter first and then rest a chicken breast in each pool. The other option is to pour the sauce over the top of the chicken. In either case you should pour the extra sauce into a saucer for people to pour on extra while eating. If you are plating using individual plates instead of family style, use the same concept: pool of sauce or drizzled over top (OR BOTH!) 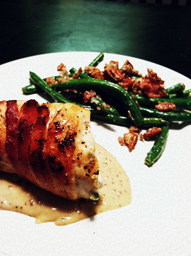 Just be sure to show off that stuffed chicken breast. The chicken was so tender and juicy and the green beans were the perfect side! YUM YUM YUM! I think I’ll eat these leftovers for dinner tonight! For the official chicken recipe from Rachel Ray, click here!